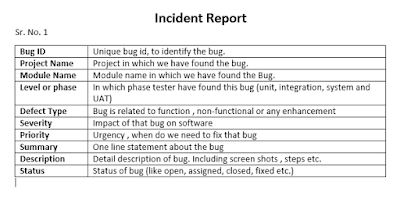 How to report a Bug?/ How to make Incident Report? The main work of software test engineer is to test the software and find as many as possible bugs in software. If you don’t know what is bug then you should first read this article what is Bug? Tester writes the test cases based on requirement and he execute the test cases on the software. Below is the image of demo test case. if the expected result is different than actual result that’s mean functionality is not working correctly. So to get this functionality fixed tester need to tell this bug ,defect to the developer so developer can fix it, tester has to tell this in detail under what scenario or under which situation software behaves unexpected. Tester can’t go to the developer and says that hey this is not working properly, get this fixed for me. This is not proper way, then what is the proper way to report the bug? 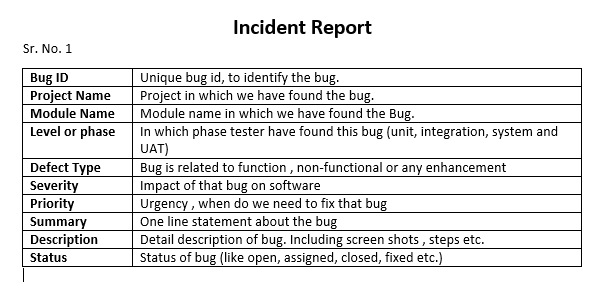 Proper way is to write the detail report about bug. We Tester’s need to write detail description which should contain needed information, using this information developer should be able to re-create the bug. So how are we going to do that? Either we can use defect management tools like BugZila , BugNetetc. or use can also use Word or Excel file. This depends on the organization how are they reporting their bug, most of the companies still prefer to use word or excel file. I am going to explain how to report a bug in Word File.Word file should contain following fields for effecting bug reporting. You will find these fields across all the defect management tools. Bug ID : it is a unique id that we need to give to each bug. Giving the different ids to bug help to identifying and tracking the bug. For example if you have found bug related to User interface you may write it as UI_1 and for any functional bug FN_1. You can write it with more details like Login_UI_1 means you have found UI bug in login module. Project Name : Software name on which we have found that bug. There might be a situation in which you have allotted multiple testing project at the same time. So this will help you and other team members to know, this bug related to which project. Module Name : Software is made of many module, we need to specify in which module we have found the bug. For example an institutional software will have Registration module, receipt module, online test module, library module etc. and suppose we found the bug in online test module then we need to write online test module. Level or Phase : There are four level of testing and those are Unit testing, Integration testing, System testing and UAT. Here we need to specify when defect is found. Defect Type : here we need to specify the type of defect.Means whether that bug is related to functional bug, non-functional bug or any necessary enhancement. If any module is hard to understand they tester may give some suggestions to make that module user friendly. Severity : Severity tell the impact of particular bug on the software. We need to define the bugs severity as High, medium and low. Severity will be high if we have found a bug and because of that bug we can’t continue our testing further. E.g. login functionality of Facebook is not working this bug will marked as severity High. Low Severity bugs are those bugs like spelling mistake in text contain or there is a wrong icon to any button. Priority : Priority is related to the time.Means urgency of fixing the bug and we also define the priority of the bug as High, medium and low. If the severity of the bug is high and we can’t continue our testing without fixing this bug then the priority of that bug would be mark as High. And in incremental and iterative type software development cycle the requirements are divided into small builds, if we have found a bug in module which is included current build release then that bug is marked as High and suppose we have found the bug is a module which is not the part current build release then that is marked as Low priority. Summary : Summary means one line statement that gives basic idea of the defect. Like login functionality is not working fine, registration page is not opening etc. it is not an details description just one line statements. Description : In this field we need to give a detail explanation about the defect. We need to give step by step process to reproduce the bug and if need we can add screenshot. Developer should easily understand what the bug is and how to reproduce it. Status: this is the last field, here we need to write the status of the bug. Bug goes through different status. Like when tester finds a bug then that bug’s status is new. When assigned to developer then its status will be assigned. Other status are Duplicate, Deferred, Fixed, Closed etc. You will get detailed knowledge about this status in Defect life cycle. Incident report in word file is looks like as shown above.